One of the primary reasons that a company or person hires an attorney is to alleviate some type of “pain”. They may use words like “challenges”, “problems”, or “obstacles”, but all of the words amount to the same thing: they are experiencing discomfort; they are experiencing pain. Their “pain” is whatever they are asking you to take care of for them. Here are some tips on closing a deal with a prospect. Successfully closing a deal with a prospect relies upon your ability to identify their pain and effectively communicate how you will help them resolve it. Too often, attorneys rush to show off their solutions before truly understanding what a prospective client needs. First get to know the issue, then provide the solution. Before you can ask for the business, you need to form a relationship with your prospect. Some attorneys have a very bad habit of trying to impress prospects right off the bat with their legal knowledge, which makes the prospect feel like they are being “sold” rather than trying to form a mutually beneficial relationship. Realize that you don’t close a deal with the first handshake — you will need to invest some of your time in getting to know them before they are ready to receive your sales message. Once you’ve identified your prospect’s pain points and started to form a good relationship, you need to prepare to make the ask. Have the necessary paperwork at hand, and then ask for the business. Prospects want to know that you actually want their business — and once the deal is done, don’t be shy about asking for a referral and/or testimonial. This gets you well on the road to your next deal. If your goal is to be a successful Rainmaker, you must perfect the art of the close. Remember that people like to do business with those they know, like and trust. 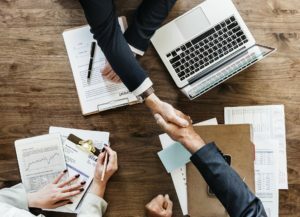 Once you have laid that foundation, you will find that closing a deal with a prospect is a mere formality to establishing an ongoing relationship.